Silver Creek is the place to go if you consider yourself an expert fly fisherman. 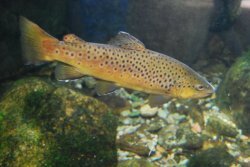 There is no room for error on this stream because it is heavily fished, it is a popular fishery, and the fish have seen it all. If you are not absolutely perfect with your casts you will have a very long frustrating day. The river is in an open area so the winds will cause the currents to change direction and increase the degree of difficulty in your fly presentation. If you want to do some Sun Valley fishing and you want a challenge this is your stream. Rainbow and Brown trout are the primary species in this water, but the creek also has some nice Brook Trout and Whitefish. It is common to find fish in the 24” + range. The trick obviously is to catch them in this very clear shallow water. This river is now being preserved and it has its very own special regulations for the stream that you are required to follow. Most people that come to this river are avid fly fisherman that are serious about protecting the sport for years to come. You can wade the first few miles of the creek but after that you will need to float tube the creek as it gets deeper and starts to form pond like areas. The Creek is surrounded by private property and you must respect the property owner’s rights when it comes to accessing the creek and getting out. So always be aware of your surroundings and the property you are on. Located just outside of Carey Idaho, North of Twin Falls, East of Pocatello, and south of Sun Valley. This is a relatively flat area surrounded by farmland with a wonderful view of the mountains. Just a half an hour or so from Sun Valley this is a great fly fishing destination. Mayflies such as Blue Winged Olives, Pale Morning Duns and Callibaetis, Drakes, Tricos and Mahogany Duns are some of the typical successful patterns. 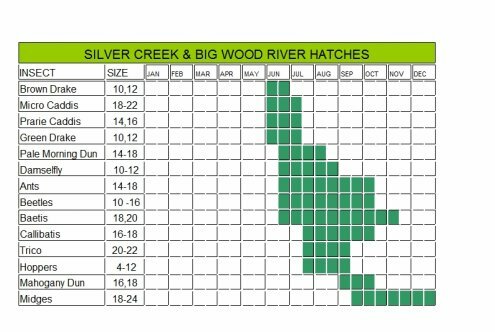 See the hatch chart that shows the fly fishing hatches, and map of the area below. Leave Silver Creek page and return to Idaho page.